I have failed my son. I admit there was some pride that welled in my chest at that statement. Yes my three year old son knew what a Dalek was. In fact not that long before this he was being assessed through the school district he told the Parent Educator that one of the line drawings he was being shown was a Dalek. She looked at me as if I needed to translate that word from cute toddler jargon for her, and I agreed with him that it was a Dalek, upon hearing this foreign term come out of a grown up mouth she looked even more confused. I had to inform her that it was a robot off a TV show, I wonder what she thought about my minivan that is covered in Dr. Who stickers (my new neighbors thought my husband was a police officer, however I did get a vehement thumbs up from a random car on the road the other day!). So I reared up my head in pride and went to look at the Dalek bobble head my son was intrigued by. 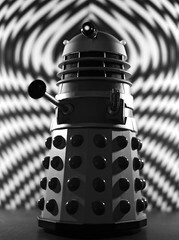 Only to my horror it was not in fact a Dalek. It was R2-D2! Ack! The adorable little beeping robot I had fallen in love with as a child was just called a Dalek� an evil robotic race bent only on �Extermination�. My pride fell to my feet and shattered there, leaving me with a disgusted feeling in the gut of my stomach. How had I failed my child this much? He had no idea who R2-D2 was� to the point that he had mistaken him for a Dalek. Even worse was his insistence on calling R2 a Dalek even when I corrected him. Oh woe is me! A solution had to be found, and immediately! So that weekend became a Star Wars marathon in our home. We watched all six of the movies and then proceeded to follow it up with the animated series on the Clone Wars. It even went as far as watching the �John Williams is the Man� meme on YouTube. The immersion worked! He is now wandering around talking about Star Wars all the time. He can recognize the logo and happily yells �Star Wars� each time he sees it. We found a book on �How to Speak Wookiee� and he leafs through it, trying to talk wookie himself and pointing out all the people he knows, �that Skywalker with the lightsaber� is his favorite (I cannot account for his taste yet). Tonight he even opted to watch a little video on YouTube about R2 instead of getting a bedtime story.